Yet Islamophobes still ask what are Muslims doing to fight terrorism. Even the Daily Mail couldn’t hide this one. 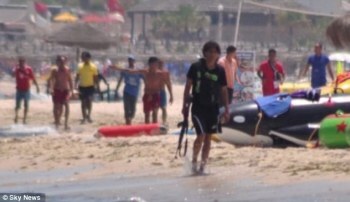 A survivor of the massacre in Tunisia has revealed local hotel staff members formed a human shield on the beach in a heroic bid to protect tourists from the rampaging gunman. John Yeoman, 46, said Muslim staff members from the Bellevue Hotel told the gunman he would have to kill them first as they formed a human barricade between the shooter and Western tourists. The chain of bodies can be seen in images taken of killer Seifeddine Rezgui which emerged yesterday – about a dozen men stand side-by-side as the gunman, pictured in the foreground, marches away from them carrying his Kalashnikov. It is just one of many incredible tales of survival to emerge in the aftermath of the deadly attack in which British survivors have described playing dead as Rezgui ‘executed’ wounded tourists. The gunman, who openly declared he was targeting Western tourists during the killing spree, was also told: ‘You will have to get past us, but we’re Muslim. Mr Yeoman said he was told what happened by another survivor at Manchester Airport after the two were among those repatriated yesterday. Meanwhile, British survivors have described how they played dead in a desperate bid to avoid being ‘finished off’ by the gunman as he indiscriminately shot down dozens of tourists. Unfortunately, this is very true. I agree, It is so easy to take any text out of it’s context. These are stories we need to see more of to counter the claims of islamophobes as much as possible. I think as long as we respect each other we can get along quite fine. It used to be so in oldf times in BiH that Muslim Bosniak families would invite tehrio Orthodox neighbors for Eid celebrations. Orthodox people made their Muslim neighbors gifts of Eadter eggs (and knowing that Easter is thzeir most important feast, just as Eid el Adha is the Muslims’ most importantfeast, then this shows that people had a high appreciation for each other. It also wasn’t uncommon for Bosniaks to have Mass said and candles lit at the local Catholic church for their Catholic ancestors; and for Bosnian Catholics ti have the local Imam recite them the Fatiha. I think of the Bosnian Serb poet Aleksa Šantić who famously dedicated a poem which later became a very well-known song to his Muslim neighbor’s teenage daughter. Ah, how I wish we had such times again, but I doubt I will live to see it. So sad. Just unnecessary malice and hatred. Let at least us do no more of that. There is a saying in the Arab Peninsula “Nothing good ever came out of the Najd”. That’s the region where Wahhabi ideology originated. Truer word was never spoken. Actually IS do the same thing as the enemies of Muslim, that is, they cherry pick what they see as convenient. You see, these guys believe that the world must be purified. And how do they do that? By fire. They’d have no qualms to kill me on the spot because according to their ideas I’m a heretic. There have been nihilist movements all along history and I don’t think they ever did any good. IS is no different and the issue is not whether Islam is an evil ideology (it is not, on the whole it’s no better or worse than any other faith) but who benefits from letting IS and similar movements thrive. See spot run, run spot run. No, it was out of their religion, but nice try. You haven’t been around here long, have you? Why so much hate on Muslims, even though some teachings in Quran were bad it doesn’t mean they follow that teachings. Those lines you mention in Quran were later added by some medieval rulers. basically Quran is a peaceful book it is one of the best books that every written. Muslims generally follow peaceful teachings of Quran, only terrorists take that bad teachings and they make all this trash. Why you so much insulting Muslims just by showing wrong verses in a medieval book. It’s a sin to hurt Muslims by calling all of them as terrorists. 2 -3 muslims attack the guys they are following Quran. Scores of Muslims trying protecting them and well ‘no never mind’. there isnt an islamic teaching which permits taking innocent life. Also Quran encourages muslims and the prophet (saw) himself using stories from the past that is one of the purpose of Quran too. So this goes hand in hand with teaching people to be better and not murderous. Not to mention Muslims have been using this verse to justify their helping other people or admonishing the people who are evil, so it as a verse is well placed and serves to help muslims to be a better person. So much for your understanding of the text. Well we both know they’re not spreading mischief. So the human shields are like what? You’re trying to make Minority Muslims represent Islam (you’re not even being subtle). But those majority Muslims represent what? I have been meeting some pretty cool Bosnians lately. OK, is there NO admission to radical muslims on this site? Radical terror comes in ALL shapes and forms. Just this week, two children whose ages were not known were crucified in the Mayadin, Deir Ezzor province in eastern Syria after ISIS accused them of not properly fasting during Ramadan. The children’s bodies, put on public display on crossbars, each bore a sign explaining their violation during the holy month for Muslims that runs June 17 to July 17. With each execution justified by ISIS’ medieval interpretation of the Koran, the group is attempting to portray itself as the true practitioners of Islam, say experts. So why the denial of radical Islamists? ***NEWSFLASH*** Tunisians (or anyone in their right mind) would not form a human shield against gunmen. Sounds noble, but not for a bunch of tourists. That’s just plain bad reporting. Oh yeah, and the pic posted is hardly a “shield”. Show some video of that, and maybe I’d consider this story to have some relevance of truth. Yes, he’s just another evil little hate filled fascist genocidal twerp. Trying to reason with him is as much use as would have been trying to talk Radovan Karadzic into not starting his genocidal crusade back in 1991. I thought if he quotes out of the Holy Qur’an so freely that he had read it from beginning to end, but no, for if he had it would certainly have opened his mind. But no. Probably he just copies-pastes from the usual suspects. Tsk, tsk, tsk, not even original that fellow. A pathetic fraud he is, like most of his ilk. He was Nazi on the outside, but dissident on the inside, another way his deeds wouldn’t have worked. Your picture of Islam is probably one of a “religion of war”… It is a selective picture of an entire civilization, world religion. Just imagine that’s such a complex thing that you can’t just describe in a few sentences. The vast majority of Muslims are no terrorists, they’re not even warriors… Their preoccupation is not killing, but LIVING. Koran exegesis has layer upon layer of centuries of wisdom, sometimes errors, but their goal was almost universally to generate stable societal conditions. If you look at other civilizations, there’s as much bad as good too, but you are an aspect of humanity I would call bad. Likening him to the cetnik 1992 in Bijeljina trampling the bodies of his victims (as I have done and will continue to do) is still a flattery for this despicable individual.